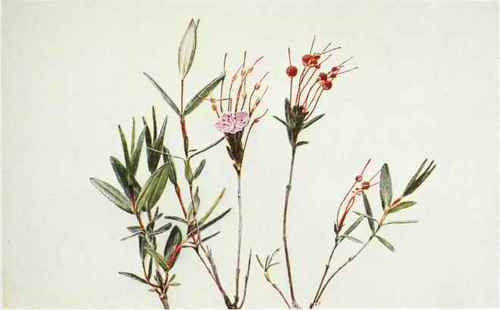 A small shrub, 6 inches to 21/2 feet high with erect or ascending branches and two-edged twigs. Leaves opposite, rarely in threes, nearly sessile, oblong or linear-oblong, blunt at the apex, green above, glaucous-white below, one-half to 2 inches long, one-sixth to one-half of an inch broad, with revolute margins. Flowers few or several, purple, one-half to three-fourths of an inch broad, in simple, terminal umbels on slender stalks one-half to \\ inches long which are erect in fruit. Segments of the calyx with rough margins. Corolla structure like that of Ka1mia angustifolia. Fruit capsules about one-fourth of an inch long or less. In bogs from Newfoundland to Hudson bay and Alaska, south to New England, Pennsylvania, Michigan, Montana and California. Flowering in June and July.